Midwifery & the new American way of birth..
out-of-hospital birth is making a come-back in our nation. Though the number of home- and birth center births is still relatively small, it is rising steadily and we believe that credit is due in large part to the increased media attention, the world wide web, and especially independent films and documentaries that have built consumer awareness of the current options. One such popular film, "The Business of Being Born", has had a tremendous impact on many new families' decisions surrounding the birth of their child. Most new clients will tell me that viewing it was a revelation to them. Certified Professional Midwives are growing in numbers as well. The majority offers homebirth services, some work in birth centers, and some do both. This is a far cry from the ways of the fifties and sixties in this country, where all births took place in hospitals and babies were born to doped-up mothers, often complicated by episiotomies and forceps delivery. The acknowledgment that the birth experience belongs to the mother and her baby and that it should be protected from unnecessary intervention and possible harm is slowly, but finally gaining ground. This, in our country with its alarming C-section rate (nearly 34% in 2016) and South Carolina being among the ones at the top of the list. It is incredibly encouraging to note that an ever increasing number of pregnant women are asserting themselves by touring birth centers, interviewing midwives, and realizing that they need to actively participate in- and take responsibility for their prenatal care and birth, in order to achieve the best possible outcome for them. Along with this trend, modern childbirth preparation classes developed by women are also gaining popularity. They teach coping skills through insight and respect for the physiology of normal childbirth, and as such they are a good fit in the natural birth setting. 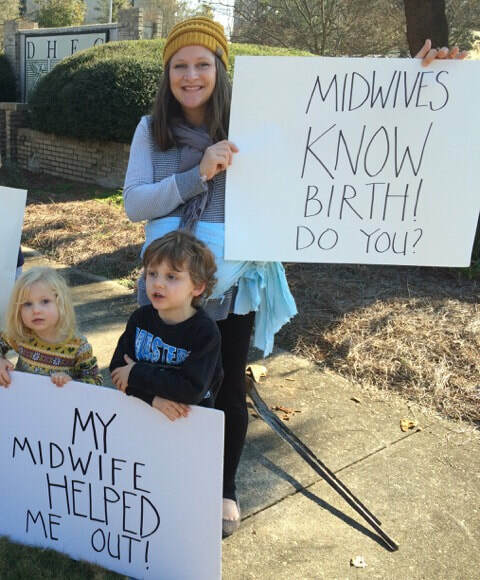 The state of South Carolina licenses Certified Professional Midwives to practice independently. Prospective midwifery clients are typically in good health, have no complicating medical history, and are willing to take responsibility for their pregnancy and birth in collaboration with their midwife. Having one's baby out of hospital with a Licensed Midwife is a viable option for SC families, and we are very happy to respond to the growing demand for our services !